I’ve never been good with mornings, especially when this week brought so many late on hard floors. Nevertheless, I couldn’t bear to miss a musical with such hilarity, melodies, and sadistic terror as Little Shop of Horrors. Throughout the show, the cast remains phenomenal in singing and acting alike. Everyone’s accents are on point, and the energy they bring to each scene is remarkably admirable. The multi-roles vary gorgeously, and each character that walks on-stage resonates with the same quirkiness of the original material (props to Jack Hawkins going from sadistic Dentist to mild-mannered First Customer). The band, too, effortlessly accompanies the strong harmonies. Indeed, this is a very tight cast that works flawlessly together. The set is somewhat simplistic, and the imaginary wall of Mushnik’s Skid Row Florists is sometimes disregarded in a couple of scenes. However, there is a great deal to admire in Jordan Jones’ dedication to the set as Audrey II. Jones goes from motionlessly quiet to vocally dominating the stage, all from the comfort of a pot. The street urchins’ unison should be celebrated too for their great clarity in singing the narrative, as well as their joint effort in following the choreography. The choreography could have been pushed a little more with such a talented cast, but what the cast had they performed with vigour. I had a fantastic time with this musical, chortling along the way to the many quips and hilarity, as well as enjoying the beautiful vocals of the cast. 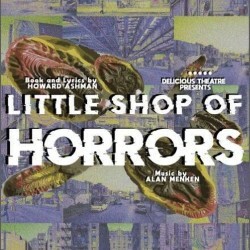 Delicious Theatre’s Little Shop of Horrors is a pleasure to watch, listen, and tap your foot along to.